Originally, I had absolutely no desire to read this book. I may be in the minority but I actually don’t like Zombie novels. I think the last book featuring Zombies I read was Cold Kiss by Amy Garvey and that was a one Zombie situation so I let it slide. What changed my mind and put this on my TBR list was 1. That absolutely amazing cover (which I tried to ignore) much like a little kid going OwWw Shiny! 2. 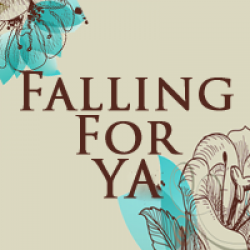 The blog tour (and all the swooning over Cole that went on). A little forewarning is necessary about this book. 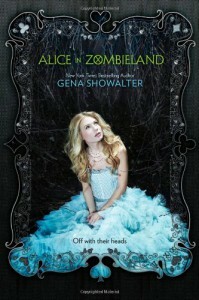 It is NOT a re-telling of the classic Lewis Carroll Alice in Wonderland story with Zombies. It is more of an independent story that happens to have a few Alice elements. Alice or Ali has grown up with a father who can see monsters and so keeps the family in the house after dark. Following her families death Ali begins to see the monsters as well. I was not overly fond of any of the characters in this book and I think that is one of the reasons for my low rating. While all of the characters seemed real to me (I really enjoyed the dialogue) I didn’t think they were fleshed out. It was obvious why Ali was sad and why she was attracted to Cole but I never really felt like I knew her and this book being written in first person I really should have known her. The only time I truly related to Ali was when she was conversing with her sister and this was because it reminded me a lot of the relationship I had with my own sister growing up. The Romance in this book is insta-love. The second Ali sees Cole across the hallway they share a vision and while she does try to avoid him it is kind of impossible to do so (what with the Zombies and all). This actually didn’t bother me because the insta-love was explained later in the novel. What bothered me was the hot-cold-hot again-cold again relationship between Cole and Ali. I was never sure if they were going to be all over each other or were focusing on the Zombie problem. I also didn’t like that Ali was completely fixated on Cole’s ex, Mackenzie. I understand their situation was unique but if Ali truly trusted Cole she would have believed that things were over and let it go. Overall, while I have given a few negatives of this book there were also some positive things about it. The idea is really original, the characters were interesting enough to make me finish the story and I enjoyed the sister relationship between Ali and Em. I am undecided if I will continue this series but if the cover is just a lovely as this one I may be enticed by the shiny-ness and continue.